Congratulations to our Bull Mountain Racers – and former Bull Mountain Racer – for great results! Anika earned 1st place in the Teck BC Cup series aggregate awards in the Midget category (2006) girls xc skiing. Nadia earned 2nd place in the Teck BC Cup series aggregate awards in the Bantam category (2008) girls xc skiing. Cole Turner, who started out skiing with the WLCCSC but now trains in Kelowna with Telemark Nordic, won 1st place in the Junior Mens (1999-2000) Teck BC Cup series aggregate awards. Four of our Bull Mountain racers participated in the recent Teck BC Midget Championships, which is an annual event for kids ages 9-12. 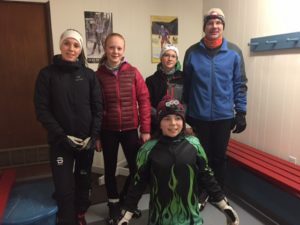 There were three events: 2 km classic race; 300 m skate race; 1.5 km team relay race. It’s a popular event, with 25-35 competitors in each boys and girls age group. Anika came earned a silver in her classic race! Jake, Anika, Nadia and Oi teamed up to make a Bull Mountain Wranglers relay team, and won tasty cookie medals, coming in first in their Unofficial Relay Team category. Thanks to all who showed up to enjoy our trails and free rentals from Caribou Ski and WLCCSC’s Ski School program. Over 100 people attended today’s Wellness Day – a new record! It was great to see people of all ages heading out to enjoy the warm, sunny day. Many thanks to the First Nations Health authority for providing and serving the delicious chili and bannock! Thanks also to Caribou Ski for bringing up masses of skis, boots, poles and snowshoes! And thanks to the many volunteers who groomed the trails in preparation, helped with the equipment, greeted people at the registration desk, did the clean up, and took groups out to give beginner skiers tips and directions! We are open! Check out the trail report…..